James Nesbitt’s love for his home town has always been there to see, and in particular his passion for Coleraine Football Club. 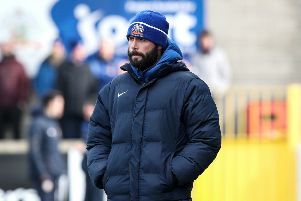 The star of popular dramas such as Cold Feet and Lucky man, as well as Hollywood blockbuster The Hobbit, is a keen football fan and always takes in a match at The Showgrounds when his schedule allows. His support for the Bannsiders doesn’t end there though. Yet again he has shown his commitment to the club he holds so close to his heart by making a financial donation. Club chairman, Colin McKendry, thanked James for his continued support. “It’s no secret to anyone in football that James is a Bannsider and is a regular visitor at the Showgrounds when he is at home,” he said. “His generous support is welcomed by the club and we wish to publicly thank him for it. The news comes as a big boost to manager Oran Kearney as he prepares for the new season. He has signed up keepers Chris Johns and Michael Doherty with Andy Findlay going out on loan to Wakehurst. Adam Mullan, Ian Parkhill and the experienced Steven Douglas have also agreed new deals with the club. “It’s another big boost for us to sign the three of them up. Kearney has also enlisted the services of Gareth McConaghie, who joins from Dervock. “Gareth is in a very similar situation to James McLaughlin,” he said. “He has bags of talent and was really too good for the league he was playing in. “This is a great opportunity for him now to kick on again after previous spells at senior football.